These last few weeks I’ve been struggling with a lot of fear, anxiety and worries. It’s holding me back in all my dreams and desires, and takes away the beauty in the everyday. I feel trapped in a hole I can’t get out of, and I realize that I’ve entered a vicious circle that I need to break. I’ve tried positive self-talk, encouraging myself, comforting myself and trying to convince myself that everything will work out… But nothing seems to keep the factor fear out of the equation. And it will probably never disappear completely, but it’s about time that the intensity of it softens, so it’s time to look further. It’s time to do some research about fear and how I can cope with it. It’s time to look into my fears, and explore them inside out, no matter how scary that may be. It’s time to find ways to handle these fears when they overwhelm my thoughts and feelings. It’s time to get working. If you google fear, handling fear, coping with fear, anxiety, or any similar search terms, you will find tons of resources. Books, blogs, psychology magazines, fear management techniques, and many more. 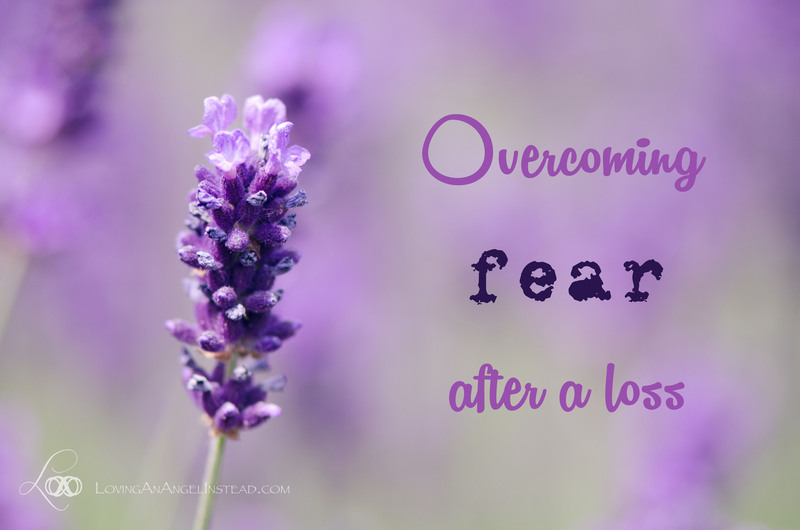 But the fear that is experienced after a loss is very specific. It’s very real, because we’ve experienced the death of a child. It’s a founded fear, because it’s based on one (or more) of the most tragic losses that can be experienced in life. That’s why I decided to revisit all the advice and methods that exists surrounding this topic, and share my thoughts about them from the perspective of life after loss. Hopefully I can find my way to a time where I can conquer these fears, calm them down, control them and even handle them. Hopefully I can reach a point in which fear doesn’t take control of my actions, of my thoughts, of my dreams. And hopefully by sharing this journey, you will find some techniques to cope with fear as well. My greatest fear, is that I will never be able to mother a child on Earth. I’m afraid that we will never have the family we always dreamt of. I’m scared I will never get pregnant again. I fear to suffer another loss. Do these fears make any sense? My first response would be: “Of course they make sense, I did lose my first daughter didn’t I???”. This fear is based on a true event, making it very concrete. But after thinking about this twice, I can look at it from a different perspective too. I’ve proven that my body is able to conceive, that I can carry a child, and that I can get pregnant naturally. All the genetic research that was done when Sahar’s condition was diagnosed, came back negative. There’s no known recurrence risk. Chances of this ever happening again are almost nihil. Almost. There are no guarantees. How do these fears impact your life? I have to admit that, at times, they control me. At times, these fears are the only thing I can think about and they poison all my dreams and hopes. They can drive me up to a point where I think I’m not able to breathe anymore. They block me from enjoying the small joys that are hidden in everyday life. They interfere with my dreams, my beliefs, and my expectations for the future. They turn the future into a dark, unpredictable and scary place. Why do these fears have a hold over me? I think that’s an obvious one, but it’s actually a difficult one to answer. They have a hold over me because from childhood, my biggest dream has always been having a family with at least two -living- children. They have a hold over me because I know the pain of having a child in heaven, missing them every day, and not being able to see them grow up. Maybe this list will grow, maybe it won’t. I’ll try to visit each and every of these topics in a separate post and keep you updated about the effects. If you have any advice, extra ideas or methods that could work, please let me know in the comments below. I would love to try them out!